Your SmartBolts shipment has arrived, along with a Certificate of Compliance, which lists your SmartBolt specifications including bolt dimensions, grade and finish, as well as proof load, and other important information. 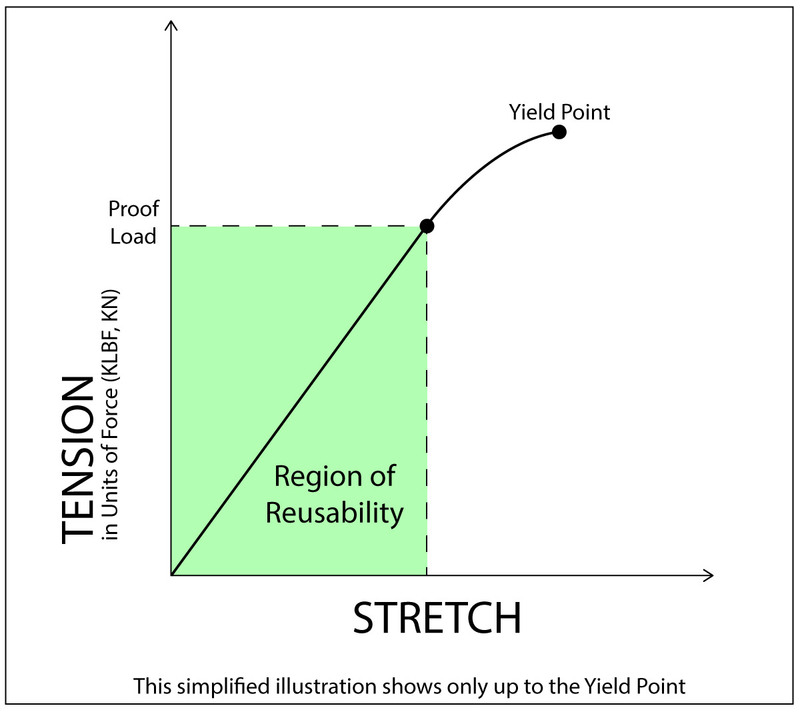 In this article, we will explain in simple terms the meaning of proof load and why it’s important to know the proof load when specifying the tension for a steel bolt. Even though bolts may seem perfectly rigid, steel is an elastic material. This means that when they are tightened in a bolted joint, they actually stretch a tiny amount. Think of the bolt in a bolted joint as a stiff, metal spring. By tightening the nut, you are creating tension, a load or force that pulls on both ends of the bolt. As you increase the tension, the bolt stretches the way a spring would stretch when you pull against both ends. If you loosen the nut, the bolt relaxes and returns to its normal length the same way a spring returns to its original shape when you release it. This ability to stretch and release is called elasticity. (It’s elasticity which causes the tightened bolt and nut to clamp down on both sides of the joint, holding it together). If you stretch a spring too far, though, it loses some of its elasticity. When you let go, it doesn’t fully recoil, like a toy slinky that won’t return to its original shape. Just like an over-stretched slinky, if a bolt is stretched past a certain point, it loses some of its elasticity and starts to become permanently distorted – called plastic deformation. The yield strength of a bolt can be defined as the tensile force that will produce a certain amount of permanent deformation within a specific fastener. 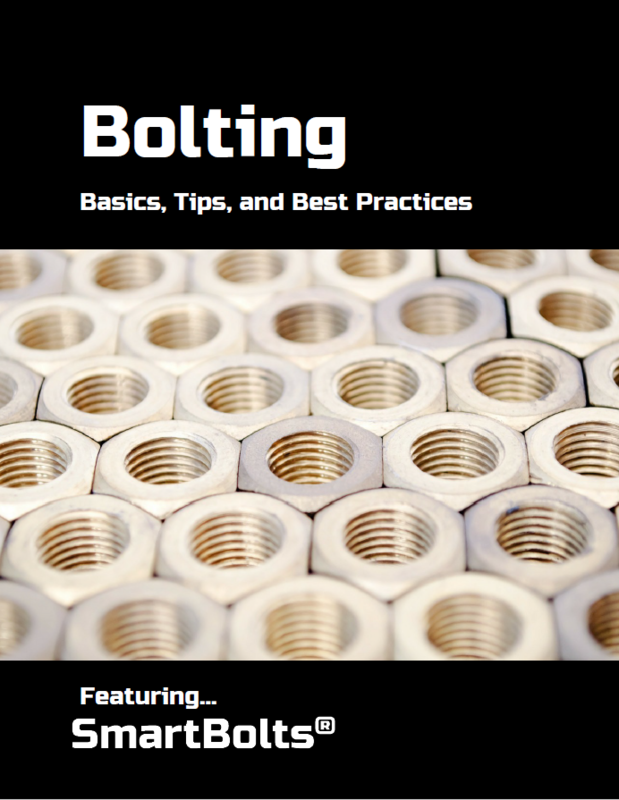 In many (but not all) bolting situations, it’s important not to tension a bolt past its yield strength, because it no longer retains its original size and shape and ultimately its performance in a bolted joint. 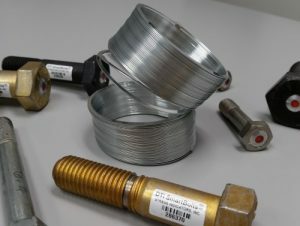 In most applications, if the bolt has been tightened past its yield strength, it is no longer reusable and will have to be thrown away if loosened. Proof load is the limit of the elastic range of the bolt. Designing for the use of bolts according to proof load can help prevent plastic deformation. As long as a bolt is never tensioned beyond its specified proof load, you can be assured that it has maintained its original size and shape, and may be safely reused. Now let’s look at the relationship between tension and stretch of a bolt as it appears on a graph. This graph shows what would happen if you performed an experiment on a bolt by measuring how much a bolt stretches as it’s tightened. The graph starts in the lower left corner, at a point with no tension and no stretch. As tension is added, the bolt stretches a certain amount. Each time you add more tension and measure the stretch, you could record it as a point of data. Connecting many data points together gives a line graph that looks something like this. In the first part of the graph, the relationship between tension and stretch appears as a straight diagonal line. At any point on that line you can loosen the nut and the bolt will relax to its original length (moving back to the zero point on the graph). Because the bolt is elastic, you can tighten and loosen the bolt, moving up and down the straight line many times without causing permanent damage to the bolt. Within this limit, the bolt will continue to perform as designed. Though it may loosen due to many causes – such as vibration or compression of the gasket material – it can always be safely re-tightened. But after the proof load has been exceeded, something changes. Beyond this point, the material begins to yield and the bolt will not return to its original shape and size when the tension is released. After reaching the yield strength, a bolt has become so permanently deformed that it is generally accepted to no longer be safely reusable due to a loss of ductility (when a solid material deforms under tensile stress without breaking). By knowing the proof load of a bolt and keeping the static bolt tension at or below this level, the bolt will retain its reusability and remain secure in a bolted joint. Click here to learn more about how SmartBolts work and how they can help maintain secure bolted joints. This entry was posted in Insights and tagged bolt tension, elasticity, plastic deformation, proof load, tension, yield point, yield strength. Bookmark the permalink. « Here’s Our New ‘SmartBolts are on the Job Worldwide’ PDF! SmartBolts are designed to operate in the elastic range where the bolt behaves like a spring and will return to its original length when loosened. As a result, they can be reused up to the fatigue life of the bolt just like any ordinary bolt of the same grade. The SmartBolts’ visual indicator provides a helpful guide to ensure you remain in the elastic range of the bolt. SmartBolts are always designed to indicate “Tight” at a level less than the proof load. This is the Design Tension value listed on your Certificate of Compliance, which you will see is less than the listed Proof Load. If you use the indicator as a guide, and stop tightening when the indicator reaches the black “Tight” color, you can be sure that you are remaining below the proof load, that the SmartBolt has not been yielded, and it can be safely reused. The primary benefit of SmartBolts is its easy-to-use visual indication of the tightness of the joint. In addition, because a SmartBolt is not tensioned more than its specified proof load, you can count on it to provide repeatable, secure joint fastening throughout its service life. To learn more about how to specify SmartBolts to fit your needs, refer to our DTI SmartBolts Technical Data Sheet or contact a SmartBolts Consultant today.